Aimee Erickson’s 14 x 24 painting “Before Sunrise” took Best in Show. The Collectors Gala was held at the culmination of the 19th Annual Laguna Beach Plein Air Painting Invitational this month. Thirty-five plein air painters, including three from Laguna Beach, were invited by the Laguna Plein Air Painters Association to compete in the nine-day outdoor painting event. Over $30,000 in prizes was awarded to the artists. LPAPA also invited local college students to participate in the Next Generation paint out event. All are all enrolled at the Laguna College of Art + Design. The Scholarship Award winning artists participated in the Collectors Gala celebration. Brandon Gonzales received the Best in Show for the graduate program. Under graduate program award recipients were, first place, Emily Bertucci, second place, Ben Jarvis and third place Kyle Larson. Collectors purchased all of the student’s works. 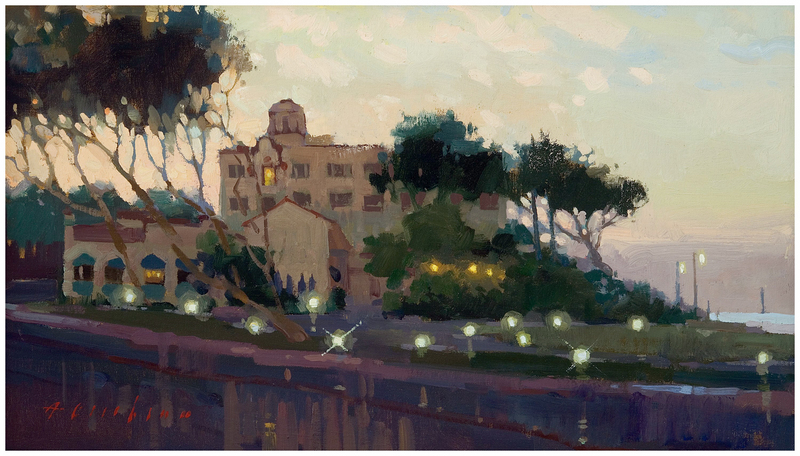 The Laguna Plein Air Painters Association is a nonprofit art organization dedicated to preserving Laguna’s artistic legacy while providing opportunities for today’s landscape painters.